We’d love your help. Let us know what’s wrong with this preview of The Quiet Book by Deborah Underwood. All quiet is not created equal. In this irresistibly charming picture book, many different quiet moments are captured, from the anticipation-heavy “Top of the roller coaster quiet” to the shocked-into-silence “First look at your new hairstyle quiet.” The impossibly sweet bears, rabbits, fish, birds, and iguanas are all rendered in soft pencils and colored digitally, and, a All quiet is not created equal. In this irresistibly charming picture book, many different quiet moments are captured, from the anticipation-heavy “Top of the roller coaster quiet” to the shocked-into-silence “First look at your new hairstyle quiet.” The impossibly sweet bears, rabbits, fish, birds, and iguanas are all rendered in soft pencils and colored digitally, and, as in all of the best picture books, the illustrations propel the story far beyond the words. A sure-to-be-a-classic bedtime favorite. To ask other readers questions about The Quiet Book, please sign up. I saw this and I wanted to remember those quiet moments of pause, anticipation, joy, or anxious buzzing inside my brain. Because I love illustrations and the cover looked calm and cute, I read it. The illustrations were cute and well defined the events being depicted. There were some very typical events chosen for a silent pause as well as some definitely not so conventional; so I enjoyed that. I love a well-thought children’s story. An apologue with clever illustrations and amusing wordage. 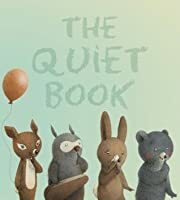 The Quiet Book is about a little bear and rabbit -along with their friends- who share snippets of cohesive moments. Breaths of hush. The pictorial images are in muted browns and greys and blend with their smidgens of silence. I was going to list you my favorites but I love all of them. This is a wonderful book to read to girls and boys, 4 or younger, but I wouldn’t be surprised to see older childre I love a well-thought children’s story. An apologue with clever illustrations and amusing wordage. I really liked In a Blue Room but I’m not usually a fan of “go to bed” or otherwise “quiet down” books. I loved everything about this book. Every page is precious. Kids will appreciate all the different kinds of quiet and can think up some of their own. The illustrations are perfect. This is a good bedtime or anytime book. The “story” goes from waking in the morning to bedtime, with what could be an extremely full day in-between, but they’re probably activities during many days. I read it then I im I really liked In a Blue Room but I’m not usually a fan of “go to bed” or otherwise “quiet down” books. I read it then I immediately read it again. It would definitely make a great gift for kids from birth through pre-school age, and as an adult I appreciated it, and even though it’s very simple I was not one bit bored, and I think some young school-aged kids might like it too, especially if there is some listener participation or if early readers want to read it for themselves. I loved this book! I was concerned it wouldn't live up to the hype but, gosh, I just want to give it a big hug. I appreciate the various sorts of "quiet" that are accentuated in the text, but it is the illustrations that really won me over. They are absolutely sooo adorable without being "too precious"--there is a deep heart and sense of artistry to each illustration and they are just so sweet and so much fun! I delight in the variety of woodland creatures we get to meet, too. Three cheers for s I loved this book! I was concerned it wouldn't live up to the hype but, gosh, I just want to give it a big hug. I appreciate the various sorts of "quiet" that are accentuated in the text, but it is the illustrations that really won me over. They are absolutely sooo adorable without being "too precious"--there is a deep heart and sense of artistry to each illustration and they are just so sweet and so much fun! I delight in the variety of woodland creatures we get to meet, too. I just had read Underwood's Interstellar Cinderella and thought it was one of the best picture books of the year. It was wild, original, feminist and funny. 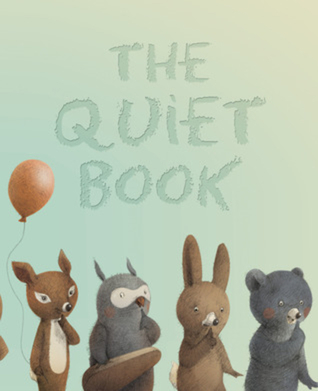 The Quiet Book was and is very popular and is also very good, though a more conventional picture book. But it's also got absolutely gorgeous, refined, gentle, elegant illustrations By Renata Liwska. Fits quiet. The writing is also elegant and original, if not the wilder departure in Interstellar Cinderella. Recommended to John of Canada by: A librarian friend. The nice thing about having librarians as friends,is that you get exposed to books you may have never considered.Especially librarians with young children.The Quiet Book is thoughtful,funny,and true to life,the artwork,a delight. Lovely bedtime read with sweet illustrations. This is a thoughtful children’s book about different types of quiet and the emotions that are felt in each type of solitude. The artwork in this book was awesome. It reminded me of an animation movie. I could picture these adorable animals moving around this book. I never thought of how many types of "quiet" there were. There are many! I smiled, I giggled, I said aweee, and it made me think of my little girl. Definitely a winner! There are many kind of quiet. Quiet can cozy. Quiet can be tense. Quiet can be worth savoring. Quiet can be gone in a flash. This book celebrates the many kinds of quiet, offering examples of the many moments of quiet in a day. Starting with the quiet of being the first one awake, the book ends with the quiet of being sound asleep. In between, readers will find examples of quiet that are funny, surprising and poignant. This is a simple premise executed with great finesse. Underwood’s one-per-page There are many kind of quiet. Quiet can cozy. Quiet can be tense. Quiet can be worth savoring. Quiet can be gone in a flash. This book celebrates the many kinds of quiet, offering examples of the many moments of quiet in a day. Starting with the quiet of being the first one awake, the book ends with the quiet of being sound asleep. In between, readers will find examples of quiet that are funny, surprising and poignant. This is a simple premise executed with great finesse. Underwood’s one-per-page examples of quiet each end with the word “quiet.” As you read through the book aloud, you will discover which of the examples make you hush your words even more and which examples are exuberant despite the silence. Deftly done, the examples are varied and interesting. Liwska’s illustrations add to the gentle humor, offering visual examples of quiet. Her pencil and digital images are soft and witty at the same time. If you asked a child (or an adult, for that matter) how many kinds of quiet there are, I think they'd shoot you a quizzical stare. How many kinds of quiet? What does that mean? Share this book with him, and he'll understand. The quiet you experience when you're the first person up in the morning feels different than the quiet you experience when you're playing hide-and-seek, or the quiet you experience when you're following your teacher to the principal's office because you're busted, or the qui If you asked a child (or an adult, for that matter) how many kinds of quiet there are, I think they'd shoot you a quizzical stare. How many kinds of quiet? What does that mean? Share this book with him, and he'll understand. The quiet you experience when you're the first person up in the morning feels different than the quiet you experience when you're playing hide-and-seek, or the quiet you experience when you're following your teacher to the principal's office because you're busted, or the quiet when you're the last person to be picked up from school. I found myself turning the pages of this book and thinking to myself, Yep, that kind of quiet feels different. I get it. And I think kids will, too. What a great idea for a book! I'm thinking of using this to read aloud to my class at the beginning of the school year. I love the concept of different types of quiets. Some of my favorites in the book are: "swimming underwater quiet," "first snow fall quiet" and "story time quiet" - probably because they all bring back such great memories. When I read it to my students I'll have them come up with their own list of "quiets." What a beautiful little picture book. Thank you to my Goodreads friend for the recommendation. I’m the “lollipop quiet” type of person. This delightful meditation on being quiet - the many different kinds of quiet time, the many quiet activities possible - would make the ideal bedtime book to read to very young children. With a simple text that is little more than a list of quietness - "Pretending you're invisible quiet... Best friends don't need to talk quiet" - and adorably soft and endearing illustrations, everything about The Quiet Book has a gentle, restful quality that I imagine would prove very soporific. This is one of th This delightful meditation on being quiet - the many different kinds of quiet time, the many quiet activities possible - would make the ideal bedtime book to read to very young children. 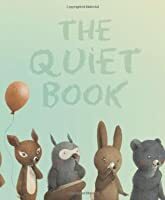 With a simple text that is little more than a list of quietness - "Pretending you're invisible quiet... Best friends don't need to talk quiet" - and adorably soft and endearing illustrations, everything about The Quiet Book has a gentle, restful quality that I imagine would prove very soporific. The beauty of stillness is something else. Not to forget what happens when there is a certain kind of hush all over the world. There is almost something magical about silences. When no one needs to say a word and maybe that is good enough. In hindsight, maybe that is how the world is supposed to be. And what better place for the world to start learning these lessons than from a children’s book. I honestly believe that children’s books aren’t written for children alone. There is a lot that adults The beauty of stillness is something else. Not to forget what happens when there is a certain kind of hush all over the world. There is almost something magical about silences. When no one needs to say a word and maybe that is good enough. In hindsight, maybe that is how the world is supposed to be. And what better place for the world to start learning these lessons than from a children’s book. I honestly believe that children’s books aren’t written for children alone. There is a lot that adults can learn from these books and apply in our day to day lives. “The Quiet Book” is about simple twenty-nine kinds of quiet that children go through in their daily life. What makes it so special is that it is so relatable even to adults. We have all been children at some point, so we know how it was to experience the quiet before we have to yell “Happy Birthday” surprise (which we still do) and also the kind of quiet when we do something not so good. There are all types of quiet in the book – happy quiet, sad quiet, also pondering quiet (for instance when you are the last one to be picked up from school) and many more. The idea really is to introduce children to “types of quiet” and the serenity they bring to life. Deborah Underwood and Renata Liwska’s combination when it comes to words and illustrations is simply terrific. It is adorable. It is cute. It is a book full of heart and soul. No word or illustration is out of place and that is how a picture book should be. I have as an adult read it close to five times now, just because it helps me find my calm. I can then only imagine the effect it will have on children. If you are stuck on what to gift a child, I highly recommend this book. Awwwwww. Love this book. Illustrations are sweet and whimsical. You gotta see this one yourself. Perfect book for quiet time. And my college-level writing class on quiet and what it means. Yes, I'm in my 20s and read a picture book for no one but myself. Not to a little niece or nephew or cousin or neighbor—nope! And not to study for the upcoming Literature GRE Subject Test. Nope! I picked this one up and read it entirely of my own volition. And what a beautiful book. As many children's books are, The Quiet Book was creative, truthful, and profound in a way I didn't expect. And it was calming! I read it while winding down after my college midterm marathon last semester, and the pa Yes, I'm in my 20s and read a picture book for no one but myself. Not to a little niece or nephew or cousin or neighbor—nope! And not to study for the upcoming Literature GRE Subject Test. Nope! I picked this one up and read it entirely of my own volition. The Quiet Book. / Deborah Underwood. Renata Liwska (ill.) / 2010. "From the quiet of being the first one awake in the morning to 'sweet dreams quiet' when the last light is turned off, simple text explores the many kinds of quiet that can exist during the day" (NoveList). "White space is used creatively to emphasize the mostly gray or brown palette. All of the scenarios are child-centric and realistic. A delightful and enchanting choice for storytime or sharing one-on-one" (Anne Beier in School Library Journal). From the excited anticipation of "Top of the roller coaster quiet" to the uh-oh moment of "Jelly side down quiet" to the wonder of "First snowfall quiet", this book covers the beautiful nuances of life's many quiet moments. I loved reading this as an adult because it had me thinking of my own quiet moments, "Bottom of the Nutella jar quiet" and "Sleeping Bea's head on my shoulder quiet". Bea seemed to enjoy it too, probably because the illustrations were engaging and the text wasn't too long for From the excited anticipation of "Top of the roller coaster quiet" to the uh-oh moment of "Jelly side down quiet" to the wonder of "First snowfall quiet", this book covers the beautiful nuances of life's many quiet moments. Brilliant collection of quiet, with delicate illustrations you want to stare at so you don't miss anything. I love the concept, and the smaller format that makes it easier for a child to hold. But the illustrations are nauseatingly sweet, even for me. I like Charles G. Shaw's art for The Winter Noisy Book better. Really 3 1/2 stars. I don't know that my preschooler really understood the book, but she did enjoy it. We had some fun, quiet, giggles in various places. The more she reads it (or has it read to her), I think the more she'll enjoy. It is perhaps a good book to use to help a child open up to disappointments or other sadness. There are pictures of several in the book. But they don't overpower the book--there are plenty of happy quiets too. This book is a quiet one, yet one that you don't want to miss; so I'll give it a shout out. I love the descriptive sentences about the many kinds of quiets. The author loves "cat sleeping on your stomach quiet" and "smelling lilacs quiet." I do too. Oh how sweet! Not in a syrupy way, but in a gentle way. This book shares different kinds of quiet. I was amazed at how powerful the examples were---very effective at evoking different types of emotion. I loved this book. It seems to me to be an example of a perfect picture book. There is sparse, simple, yet evocative language, and illustrations that add their own extra elements and humour to the story along the way. You have to see it for yourself. Gorgeous.